Every February stores are filled with the colorful, and talkative, Conversation Hearts. These sweet-talking treats always manage to make it into our pockets whether you love or hate them. But did you know this Valentines Day staple has been around since the Civil war? Before they became hearts, they were called Cockles.They were shell-shaped and the words were written on a thin paper and rolled up inside the candy instead of the words being printed on the candy itself. In the 1860’s New England Confectionery Company or NECCO, began printing directly onto their candy. It was founder, Daniel Chase’s idea. With sayings like “Married in satin, love will not be lasting” and “Married in white, you’ve chosen right” the candies became popular at humor-loving weddings . In 1902, NECCO began printing on different shapes like post cards, baseballs, horseshoes, and watches. 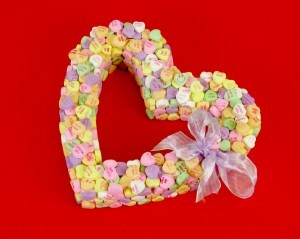 It didn’t take long before they began printing “how nice”, “love you”, and “be mine” on the Sweethearts we love today. Each year NECCO produces 8 billion strawberry, lemon, green apple, orange, grape, wintergreen, and blue raspberry flavored candy hearts to keep up with the demand. Have you wondered why the hearts have spoken a little differently over the years? Each year since 2004 Necco adds some more sayings for a more recent sounding conversation. New sayings include “Text me”, Tweet me”, and “You Rock”. What sayings would you add to this years batch of Sweet Hearts? Comment below!